I-CAN! is a collaboration between the Partnership for People with Disabilities and the VCU School of Social Work and is supported by grant funding through the Virginia Sexual and Domestic Violence Victims Fund by the Virginia Department of Criminal Justice Services. The mission of the I-CAN! Accessibility Project is to promote and facilitate awareness about the abuse of people with disabilities and to advocate for equal access to services and legal protections. The project began in 2007 and has successfully received continuation grants every two years. 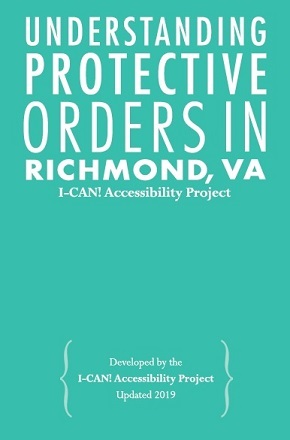 This booklet provides specific information and resources for individuals living in Richmond, Virginia, but it may also be helpful for individuals living in other areas of Virginia.